In April the Evangelical Lutheran Church in the Central African Republic (EELRCA) will hold its biannual synod in Bossabina II, a village in northwestern Central African Republic (CAR). Bossabina II is located in the Sahel region of CAR, where it is hot and dry, with little annual rainfall. Water is scarce and trees grow only head-high. On a reconnaissance trip in January, PASE (the French acronym for the Water Management Project of the EELRCA) found that the people of this impoverished area have no source of potable water. Instead, they are forced to drink water contaminated with bacteria and parasites. This week PASE is traveling to Bossabina II (about 4 hours north of Bouar) to build three spring boxes to help supply the local villagers with potable water. The photo is of the truck ready to leave our office in Baboua with 12 sacks of cement, boards for formwork, wheelbarrow, rebar, pipes, tools, etc. 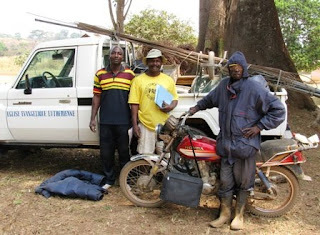 Pictured from left to right are: the driver, Ninga Luc; PASE director, Abbo Jean Marc; and PASE employee Moussa Salomon (dressed for the long, dusty motorbike ride). The work crew of seven Central Africans, including one engineer, two masons, and four animators (community development workers), are expected to be in the field for two weeks. Th U.S. Embassy in Bangui continues to search for economical ways to provide potable waterin CAR. We are told that they only way to get clean water is by digging wells 30 feet deep, which costs an average of $30,000 a well. Any cheaper ideas you have to share to create wells deep enough for clean water would be welcomed by us!